Kastro in Chora in Folegandros. Close to Nikos Taverna in Chora is one of the entrances (the other entrance is a little further away) to Kastro: the village in the village. Kastro means castle, and a Kastro was built on almost all Greek islands when pirates ravaged the Aegean Sea. They were built mostly on a rock far from the sea, often in places with unobstructed views in all directions in order to detect intruders. The dwelling houses were part of the defensive wall, usually there was only one entrance; windows and doors faced the inside. When the pirate attacks stopped, the people moved closer to the sea or built houses outside Kastro. One of the entrances and exits in Kastro. Today, there are few inhabited "Kastros", many are in ruins, or are uninhabited. 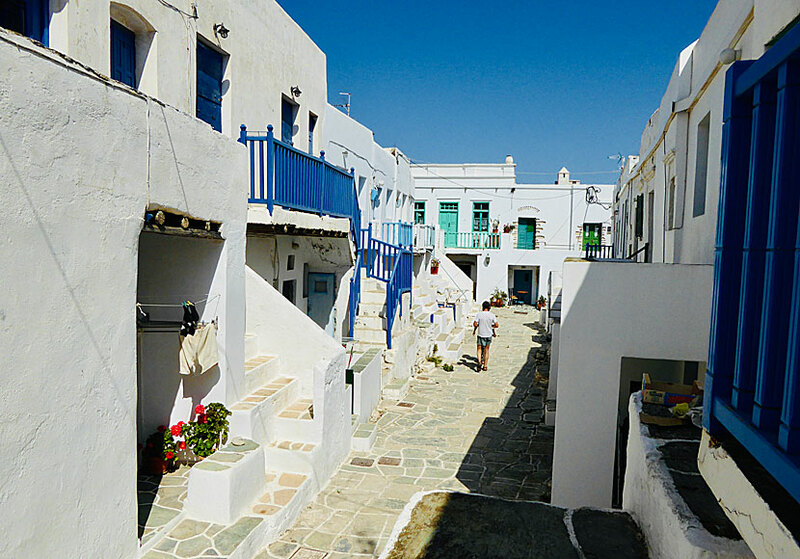 The best preserved and inhabited are the ones on Antiparos, Kimolos and Sifnos, together with the one on Folegandros. 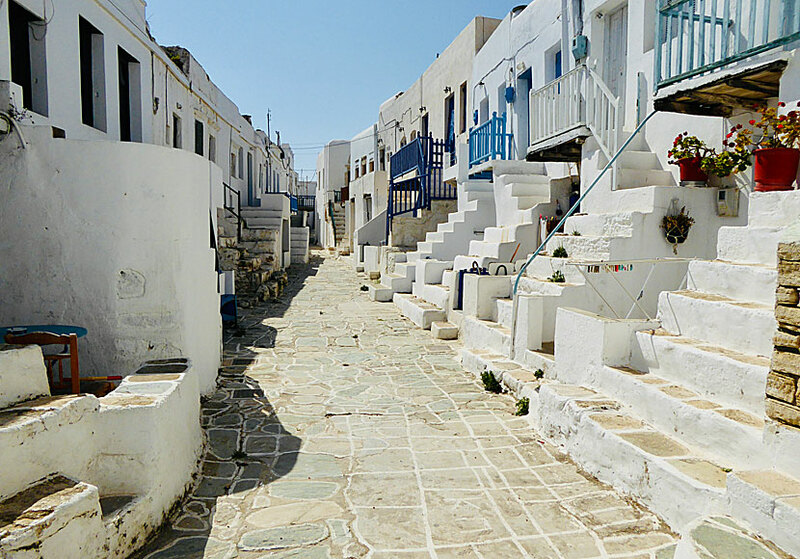 The archipelago's most impressive Kastro stands on Astypalea - but no people lives there. Only cats. It is believed that Kastro (now we're talking about the one on Folegandros) was built by the Venetians as early as during the 13th century. It is many years ago. Today, Kastro is a part of Chora. What is known is that there lived about 60 families in Kastro in 1870, outside - in what then was called Chorio it lived about 120 families. Today, about 400 people lives in Chora, I do not know how many of them lives in Kastro. What I do know, is that I would not say no if someone offered me a house in Kastro. Especially, if there was a house that overlooked the sea. The cliff where Kastro stands fall steeply - it is 210 metres down to the sea - and the view is of course accordingly. 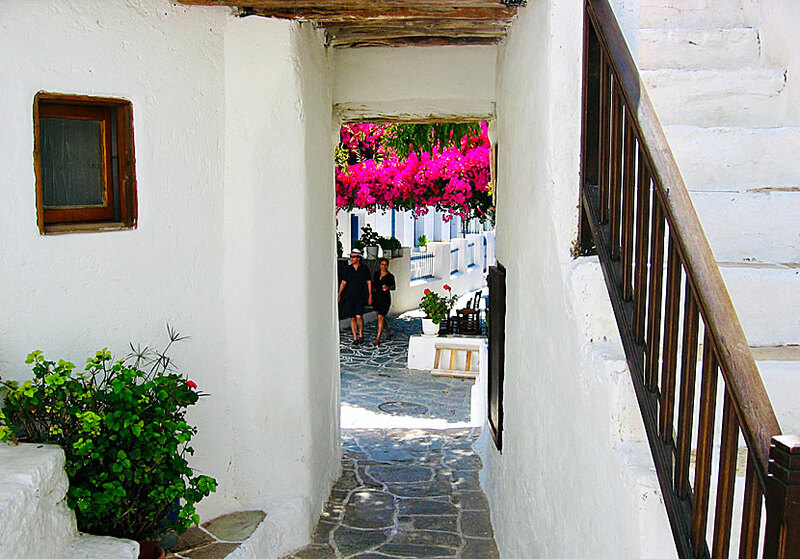 Kastro is part of Chora in Folegandros. Kastro i well worth a visit. It's small, but oh so charming with its narrow alleys lined with whitewashed houses with steps leading up to wooden balconies. The alleys are home to many of the island's many cats. There are no facilities, but three churches and beautiful bougainvilleas. An interesting detail is that for some of the houses they have used ancient columns and Roman bust statues as house building material.